Did you ever wonder what a poem sounds like? This Make idea is all about taking text (your own, or maybe someone else’s) and turning those words into music. The P22 Music Text Composition Converter does the hard work for you, but you still have some choices — instrument voice, beats per minute, etc. How might you take this text-music idea a step further? Why not use the text-music download (it is a MIDI file, so you might have to do more conversion to MP3 via a site like Zamzar) as a soundtrack to something that goes deeper with the text? 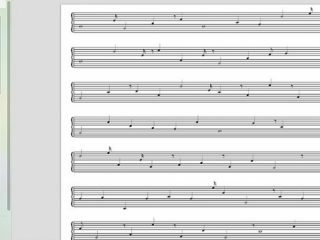 Or print out the musical score, and play it live (or ask a friend or two to accompany you). This work by Kevin Hodgson is licensed under a Creative Commons Attribution-NonCommercial-ShareAlike 4.0 International License.